The project brings together the idea of youth, high technology and the future. 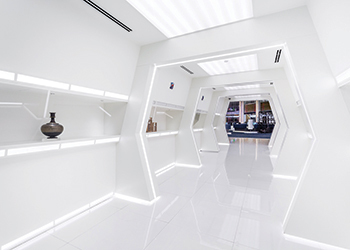 The Star Trek-inspired interiors of the newly refurbished Dubai Financial Market have been designed to appeal to Emirati millennials. 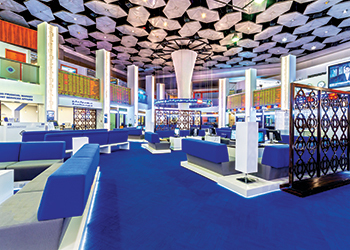 Dubai Financial Market (DFM) is set to the open doors shortly to its newly refurbished premises which have been designed to reinforce its image as a leading future-focused financial market across the region. 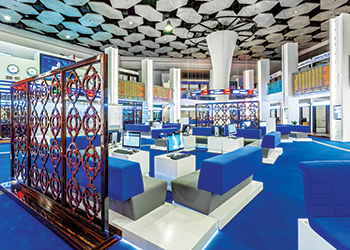 With the facelift, the trading house located at the Dubai World Trade Centre on Sheikh Zayed Road in Dubai, UAE, is sending an invitation out to the youth of the UAE to join the trading market. “Considering the big role that DFM plays in the economy of one of the most promising cities in the world and given its a prestigious location, the trading house has considered the importance of attracting the young generation to the market to enhance awareness of the business among the new Emirati generation,” Medy Naharvani, creative director and CEO of Design haus Medy (DHM), tells Gulf Construction. DHM has served as the designer and project manager for the project which was initiated in April 2016 and is now in the handover stage, he adds. The VIP hall ... elegant and luxurious. With Naharvani at the helm, DHM studio has created an amazing concept for the project that brings together the idea of youth, high technology and the future. The concept for the project is inspired by the famous TV series Star Trek and all the futuristic aspects and ideas it imparts, says Naharvani. The scope of works on the development involved the complete refurbishment of the entire space including walls, floors and ceilings and space plan changes. “It entailed attention to the smallest details of choosing and designing all the furniture with complete specs and textures/textile selection,” he explains. As the financial market had to remain fully functional while work was under way, the project was carried out in four stages, starting from inside to outside, while facilitating access and all functions. The Hot Zones represent the engine of the trading floor. These zones comprise a circular intelligent sofa and work station, where an investor can operate efficiently. The seating is integrated with tablets for investors to use, eliminating the need to bring their own. In the middle of each hot zone is a 12-m-high column featuring an automated backlit skin that changes colour to reflect the current market situation, thus enhancing the trading experience. 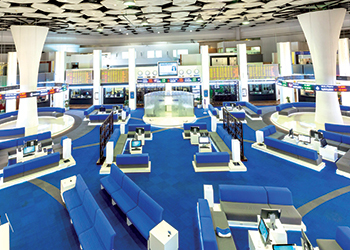 The trading floor has also been enhanced with interactive screens around the hall, allowing the customers to trade or access any of DFM services easily. The flooring of the trading hall has been covered with a custom-designed carpet that on closer look traces out the ‘infinity’ symbol across the entire floor, depicting the non-stop work engine that DFM is. To create the right ambiance for this concept, Design haus Medy studio has also simplified and unified all the surrounding small offices with black vinyl and modern signboards. The customer service areas of these offices have also received a facelift to complement with the main concept design and colour theme. They feature fully customised intelligent desks and waiting chairs that have tablets attached to allow customers to access the system and book appointments from wherever they are seated. The design theme has been extended to the first floor where the VIP reception, waiting area and hall are located. Here, the ‘floating’ reception table – which is the first thing people see as they enter – has been created as a piece of art, he says. The luxurious VIP hall is ultramodern in design and features customised ebony furniture and leather-padded wall panels. The walls of the premises have been finished with semi-glossy polyurethane (PU) wood panels, while the floors feature carpet tiles tailor-made as per the design concept. Some of the furniture has been custom-made in white Corian and fabric to ensure durability and comfort. Commenting on the colour scheme for the project, Naharvani says it echoes the corporate identity of Dubai Financial Market, which is basically dark blue with a white and grey base. Among the challenging aspects of the project were the two main columns in terms of their weight and the technicalities involved in erecting them, according to Naharvani. “Also from a construction point of view, the structure of the mezzanine floor needed a complete full support solution which required careful planning and execution,” he adds. “With the Dubai market being a highly sensitive workplace with zero tolerance for the smallest mistakes, planning the work through in phases and keeping DFM fully functional was one of the hardest challenges we had to face,” he concludes.